This is a short video on optimizing your email for mobile devices. This tip will help you remove unwanted image spacing in gmail when composing your html email. To remove this unwanted spacing just apply a style=”display:block;” to your image tag. Please help! (from a client) – My images in the editor preview look fine but when they arrive in my inbox they are blown up and they distort the rest of my newsletter. Is it something in the tables of my template layout? Thanks for your help! I looked over your e-newsletter and I don’t believe that it’s because of the tables. I noticed that you sized the images with code, and that is what is causing everything to blow out. If you look at the newsletter the images at the bottom all look larger, and that is what is causing the tables to expand. For example in your code image X is set to be 161 px wide, but in reality it’s 788px wide. The best rule of thumb is to size the images to the desired width and height before you load them into the system, this can be done in photoshop. If you do not have photoshop there is a free tool online at http://www.webresizer.com. 5 things Smart e-Marketers are doing now. 1. Including a trackable “view on mobile device” link along side the view online cue at the top of their message. Link activity can then relay the need to create a mobile version of your messages for your audience. 2. Embedding a sign up form in your email message. Once this message is shared, you want an easy way to collect new subscribers. 3. Providing unsubscribe links at the top as well as the bottom. If they don’t want to hear from you, you are better off knowing (than receiving a spam comlaint). 4. Shortening their newsletters with “read more”. Tease them and then send them to your site. Good for your Google Analytics also J. 5. Using video when and where possible. People like it, just ask You Tube! 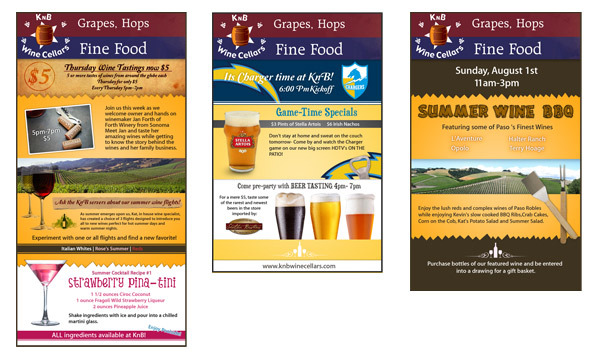 We were happy to design new e-mail templates for KnB and if you are interested in getting custom designed templates give us a call at (858) 456-7155. We would be happy to help you out.